Just when I think I am out, they pull me back in. Funko got around to doing a box based around the popular Star Wars: Rebels cartoon. I could not pull out of the sub if there was a chance to get some cool merch with my second favorite Mandalorian on it (Sabine Wren), so I let it go for another round. Will it be worth it? Let’s see. 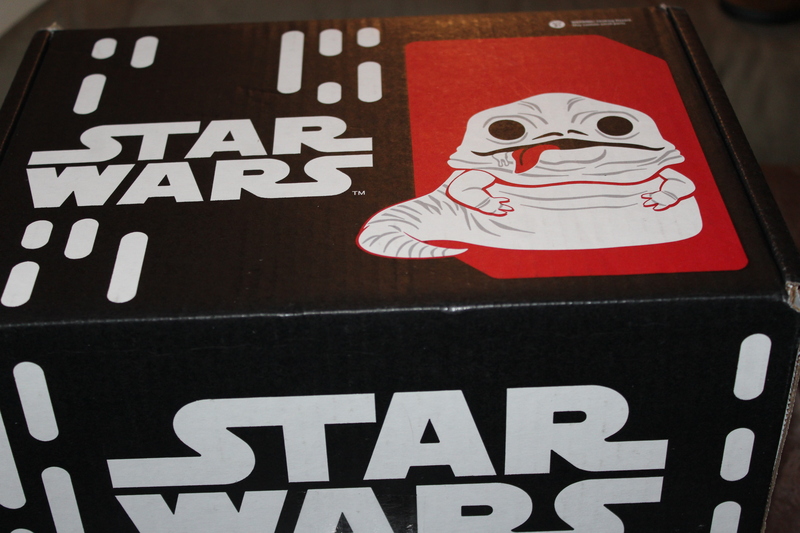 The box has the Star Wars Rebels logo and a pop style Ezra on it. Other than that, the box is the same one we’ve come to know and love. Next! Under the lid we see this month’s pin and patch. The patch is of Zeb Orrelios, the Lasat honour guard who is the team’s muscle. His look was based on the Ralph McQuarrie sketches for Chewbacca. The pin is of Sabine Wren (yes! ), or, at least, her helmet. Both are pretty decent. Next is the shirt, featuring the main Rebels cast in Pop form. The blue and orange in the picture looks good on the black shirt. There are no variants for this month’s shirt. Next is a Hikari of the Ghost’s resident droid, Chopper. This is supposed to be a Hiraki Mini, but it is larger than my Darth Vader one from months back. It stinks as well. I mean there is a strong plastic smell. There are five colours variations that you can get (red, orange, silver, black or white.) I am still not a big fan of these figures. Finally we get to the Pops. We get two. One is Darth Maul, who has recently been featured on the show. He was reveled to be alive on the Star Wars: Clone Wars cartoon. with a robotic lower half. The other is another holdout form The Clone Wars: Captain Rex, one of Kenobi’s and Anakin’s trusted clone troopers. Now aged and grizzled and on the run from the Empire, he also helps the Rebels. Though both are on the series, I am disappointed we did not get one of the main characters, they are still cool looking Pops. So that was the Rebels box. I am kind of disappointed by it, as there is no Sabine pop and I don’t like the Hikari Minis. Still what we got was good so, it just the was it goes. Maybe a future Mandalorian Box will get me the unique Sabine Pop I want to pair with my Boba Fett. The next Smuggler’s Bounty box will ship in May 2017. May’s theme is Star Wars 4o0 anniversary. You can subscribe to Smuggler’s Bounty at https://www.smugglersbounty.com/ You can also purchase the previous boxes like the one just reviewed, but supplies are limited. The deadline to subscribe for the Empire Strikes Back box is 15 May 2017.